The only student of Erkki Sven-Tüür, Estonian composer Helena Tulve shares her former teacher’s eclecticism and love for nature. Yet Tulve’s music eschews expressionist drama, reflecting more keenly the influence of French spectralism and her studies at Paris’ IRCAM (Institut de Recherche et Coordination Acoustique/Musique). Her compositions often begin with one or two central pitches or intervals whose constant timbral transformation sustains a taut structural tension until resolved. 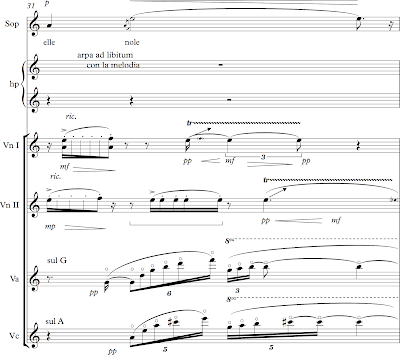 The award-winning Sula (Thaw) for orchestra depicts a crystalline, organic world in constant change, if moving slowly. Yet Tulve has been equally inspired by Gregorian chant, folk instruments, and Mediterranean vocal traditions. Her vocal compositions incorporate texts from various spiritual backgrounds within ensembles that blend instruments associated with contemporary music, early music and indigenous musical traditions. Tulve’s music occupies a similar space of paradox: her vocal technique nods to Gregorian and Mediterranean vocal traditions. But this voice is supported by a string quartet, whose members rely on trills and glissandi to blur the boundaries between pitch, timbre and rhythm. Ornamentation extends to frequent harmonics (string overtones), as well as on barely-pitched and pure noise tones. The quartet is accompanied by a triple harp, which makes use of "split doubling,” shakes and ornaments associated with Celtic folk harp traditions. In L'Équinoxe de l'âme the timbre of instruments, particularly the sounds unique to the string quartet and the folk traditions associated with the triple harp, obscure clear melodic and harmonic cues. Yet the entire piece is informed by a single-line impulse, blurred and compromised by the sonic flux around it: what was perceived as harmony becomes timbre or rhythm, and vice versa, For instance, clear emergence of a melody in first violin is echoed in remaining strings en route to the first entrance of the voice in m. 31, as can be seen and heard below. Example 1: L'Équinoxe de l'âme. m, 31. Sound is available here. Tulve places melody in the center of her process, “as principle or linear current. … everything else must be in its service.”<2> Yet this current is clouded not only by ornaments but by voices, which arrive a step below or above an existing tone, amid frequent heterophonic duplication (inexact repetition). Strings play at the top of their range, with each tiny gesture approached and left by graduated dynamics: constantly pulsing between quiet and loud. Pitch and rhythmic tropes repeat—always with a difference—to shape the organic form of the work. And the ascent of an instrument through a harmonic series emphasizes central tones with a delicacy that emphasizes their impermanence. Example 2: L'Équinoxe de l'âme. mm. 75–79. Sound is available here. All of Tulve’s works are unified by an aesthetic that prioritizes “slowness”: a careful attention to sonic transformation and flow that favors sustained listening. Tulve’s timbral choices are bound to multiple sensations that drive the compositional process: the qualities of the “sound material” and its natural expression in space. Such a sustained focus on sonic detail functions as an ethical choice as well, reflecting the composer’s deep-rooted ecological concerns, bound to music of surpassing timbral richness and textural complexity. L'Équinoxe de l'âme can be heard on Tulve’s ECM recording Arboles iloran por iluvia (ECM 2243), excerpted here, as well as on spotify and classical archives. Her recent work is available on soundcloud. <1>L’Équinoxe de l’âme, Shabab al-Din Suhrawardi, trans. Henry Corbin (French), and Tyran Grillo (English), program notes, Helena Tulve: Arboles lloran por lluvia (ECM New Series 2243, 2015). <2>Tulve in conversation with Ia Remmel, “An Oasis for Concentration. 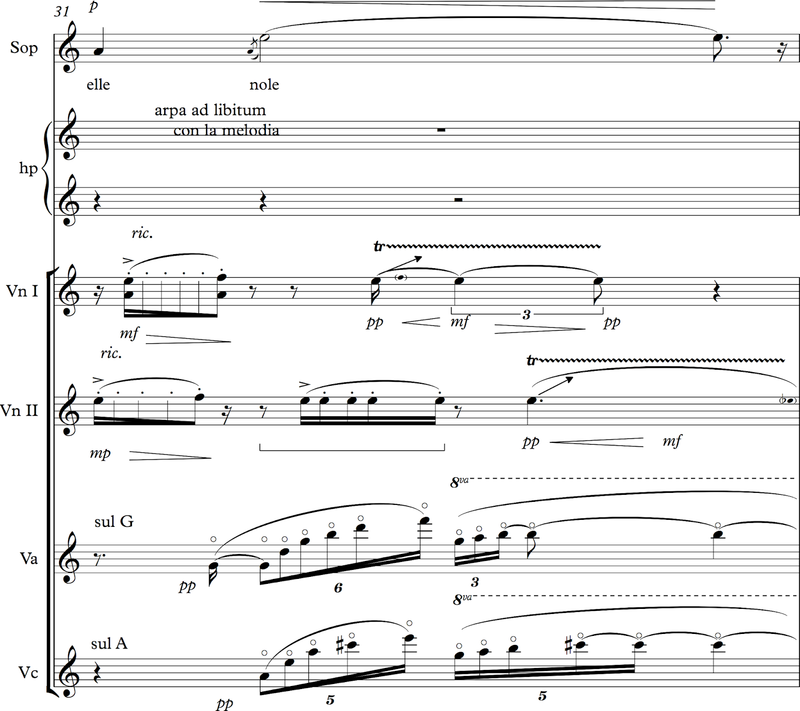 Metamorphoses in the Music of Helena Tulve,” Music in Estonia 7 (2005), 22. <3>L’Équinoxe de l’âme, Grillo trans. Amy Bauer is Associate Professor of Music at the University of California, Irvine. She has published articles and book chapters on the music of György Ligeti, Olivier Messiaen, Carlos Chávez, David Lang, Helmut Lachenmann, Salvatore Sciarrino, Claude Vivier, the television musical, and the philosophy and reception of modernist music and music theory. Her books include Ligeti’s Laments: Nostalgia, Exoticism and the Absolute (Ashgate, 2011), and the collections György Ligeti’s Cultural Identities (co-edited with Márton Kerékfy, Routledge, 2017) and The Oxford Handbook of Spectral and Post-Spectral Music (co-edited with Liam Cagney and Will Mason, forthcoming).